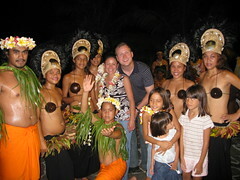 Tahiti was the relaxing stop on the tour. 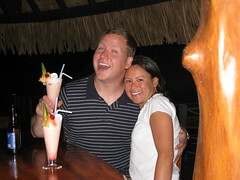 The sole purpose was to catch some sun, relax on the beach, and maybe partake in some fruity cocktails. We also weren’t too sure of what to expect, but it ended up being one of the nicest hotels we’ve ever been in. They upgraded us to a corner suite, which was huge and beautiful.There was hardwood everywhere and had a dining area, sitting area, 2 balconies, and a separate bedroom. Since it was too late to explore, we just called it a night. The next morning, we went downstairs to the over water restaurant. We had 2 pretty exciting revelations there - First, we could throw food into the water and watch fish compete for it. It was all fun and games until a huge swordfish came in to ruin the fun. He won every time. 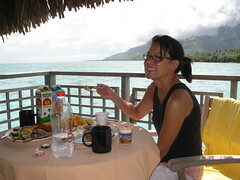 Second, we could see Moorea in the distance. After a long breakfast and an extended tour of the grounds, we hopped in a cab to the main city of Papeete (pap-ee-ay’-tay). It was a very busy, but very run down city. One of the guys we shared the cab with was headed in to get a tattoo. At the time, we both thought that was a pretty dumb idea given the condition of the city (in hindsight, we realized tattoos were invented in French Polynesia, so maybe it was an OK idea after all). 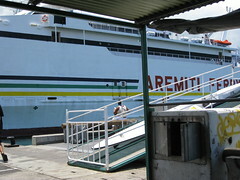 We hopped on a ferry to Moorea - the Moorea Express. It was 40 minutes and $9 each - not bad compared with a flight. However, the seas were actually pretty rough and Suellen got a little seasick. She suffered for 40 minutes. We ended up flying back at the end of the week. 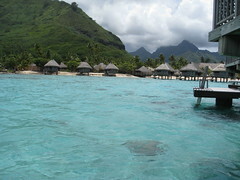 When we finally arrived in Moorea, we took a taxi to the Sheraton Lagoon Resort. Given it was a 30 minute ride, we expected the taxi to be a bazillion dollars. Luckily, it was about the same as the night prior. The Sheraton itself was absolutely beautiful… probably one of the most beautiful resorts in the world. It’s got about 100 stand alone bungalows, about half of which are over water. It also has a pretty big pool, plenty of private beach space, and all sorts of water activities (snorkeling, kayak, etc.). 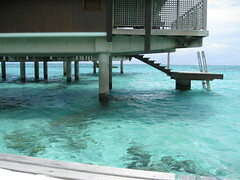 The other fact that makes the resort special and world known is all the coral reef in the lagoon. It’s located at the tip of Cook’s Bay in Moorea and is home to tons of patches of natural coral. This means lots of pretty sites and fish - it was beautiful. 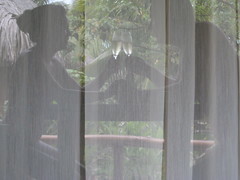 The first 2 nights, we were in a garden bungalow. That means we weren’t over water (they didn’t have any over water when we arrived. We had hoped Jay’s platinum status would guarantee the upgrade, but they were full). Regardless, the room was still pretty amazing. 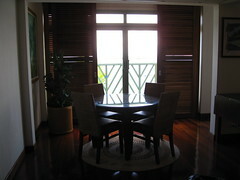 Each bungalow was like a mini-house with a private balcony. This meant nice room service options. The HUGE downside were the roosters. 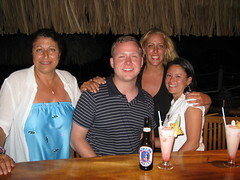 See, there are poisonous centipedes on the island of Moorea. To control them, the natives allow roosters and chickens to roam free. 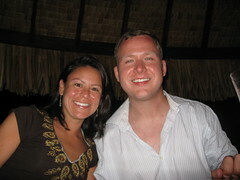 Despite trying to control them at the resort, they still returned. Both mornings at like 7am, we heard the loudest damn rooster crow ever. I swear the thing was right on our porch. Luckily, we only had to deal with them twice. 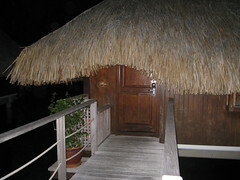 The last 3 nights, we were overwater in one of the most amazing experiences ever. 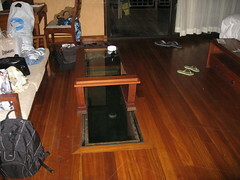 The rooms have a glass cutout in the floor where you can see the ocean below. At night, there is a light to see all the night creatures (including sharks!). While out there, our days were pretty consistent. 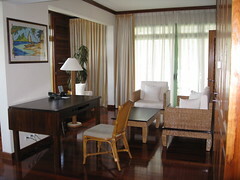 We’d wake up, have some breakfast, do a bit of snorkeling (the bungalows have a private sun deck with ladder to the water), lay out until lunch time. Shower. Have lunch at the resort, then relax for the afternoon. It was extremely relaxing, but actually got a little boring by the last day. Our first evening at the resort, we ate dinner on-site. 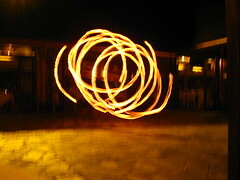 They had a fire and dance show highlighting the local traditions. Jay got called up to dance and pretty much made a fool of himself (as you can see from the pictures). The dinner also included all you can eat seafood. 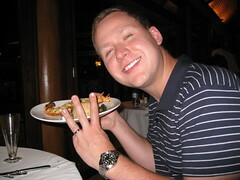 Jay had 4 half lobsters to make a fool of himself even more! We rented a car one afternoon to drive around the island. Literally, there is 1 main road which goes in a circle around the island. Without stopping, it takes about an hour and a half to get around. There’s 1 other road that goes up to a lookout point, which we also took. We were both a little skeptical until we actually got up to the top, where we were totally shocked at the view. You can see for yourself…. 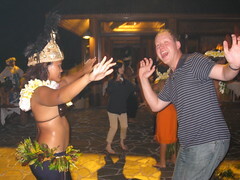 There are a couple other things to note about Tahiti. First - prices. Everything there is extremely over-priced. We had prepared for it a bit before going, so we expected the worst. Still, a cheap sandwich meal at the bar was around $25. Dinner the first night was over $200. Our rental car for 4 hours was $130 (and gas to fill it up was $7 a gallon!). Being such a secluded island, everything is imported, which means very expensive.